When is the Right Time to Invest in AAPL? Apple is the biggest publicly traded company that is not a bank, with a market value of $752 billion. Newcomers will surely want to invest in this tech giant that shows no sign of stopping, despite pivot after pivot. Before deciding when to invest it is important to identify some patterns that can give you a bigger picture of trends in AAPL. The trend is upward. Over the last 10 years APPL has seen a 600% increase, according to InvestorPlaces. This “shows a steady upward march with a couple deep valleys when zoomed out to 10 years of history.” What causes these valleys or dips at all in a company that has showed near constant growth? First there is the common industry misconception that APPL stock always falls right before an iPhone announcement. This has been proven untrue. 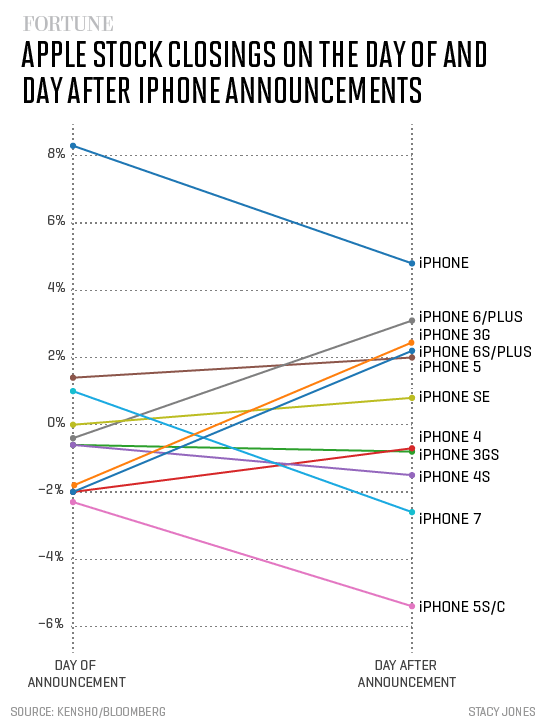 Calculations of available stock data have shown of the 12 iPhone announcements, seven resulted in AAPL stock going down the day of and up the day after. Five announcements saw the inverse, AAPL stock going up the day of and down the day after. The largest dips occurred in 2012 and 2015. The hit in fall 2012 was the largest of the iPhone era and it took Apple until well into 2014 to get back on track. This dip occurred following the iPhone 5 announcement and pre-orders, when there was a supply shortage on the new device components. At the time, Techcrunch reported that the iPhone 5 sold out twenty times faster than the 4 and 4S models, and due to Apple selling them at a loss in order to achieve parity with competitors, AAPL took quite the hit. The 2015 dip was not nearly as severe, and the recovery was swifter, but it did appear in late-summer, around the same time as the dip in 2012. A great deal of this loss was due to Apple losing ground in China. Tech research firm Canalys reported Apple slipped behind Chinese tech companies Xiaomi and Huawei in the third quarter of 2015. Complications with the Apple Watch release, on top of the worst market performance since 2008, were likely the major causes of this downward trend. Check out the chart below for a more detailed overview. These drops, be they major plunges or just blips, are all irrelevant amid Apple’s ever-rising stock. If you plan on making a long-term decision, it is all but assured that you will make money. The question is how much. So given these trends, is now a good time to invest in Apple and where is the stock likely to go? When Apple launches a new product there is more chance you will see a dip in stock value due to either production issues or selling products at cost. CNN is betting that even with the stock price at historic highs, incredulously, now may be the time to buy. It may be safe to wait until after the iPhone X launch (and give time to evaluate how profitable the iPhone 8 will be due to the X), but given the high price point and early pre-order indications it seems like there will be no replication of 2012 and 2015’s issues. 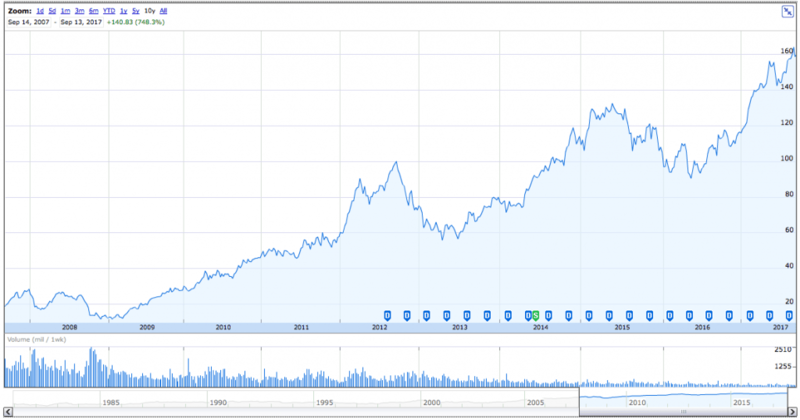 Any major drop off will surely cue a great bounce-back that will skyrocket AAPL values to new highs.